Had a surprisingly great night’s sleep after getting to bed rather early for me in town but I still was up before 6. Helen and I chatted for a bit before heading to the continental breakfast and then over to the local coffee shop/gear and book store in town. Have I mentioned how much I love that all of the local gear shops double as the espresso bars? 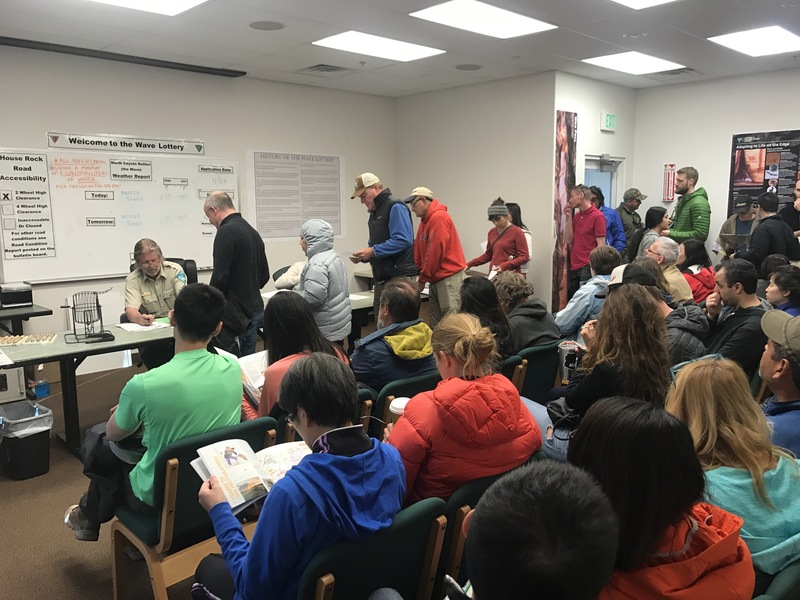 It was then time to head over to the Grand Staircase Visitor Center for “The Wave” lottery. “The Wave” is a unique rock formation just over the Utah/Arizona border in the North Coyote Buttes area of the Paria Canyon-Vermillion Cliffs Wilderness. It’s such a popular hiking destination that only 20 visitors are allowed per day. 10 slots can be reserved online by lottery 4 months in advance and the other 10 slots are put up for lottery at 9 am the day before. Helen and I showed up at the fancy Visitor Center with about 70 other people who were all trying for those slots. Seventy or so people crammed into the tiny lottery room. 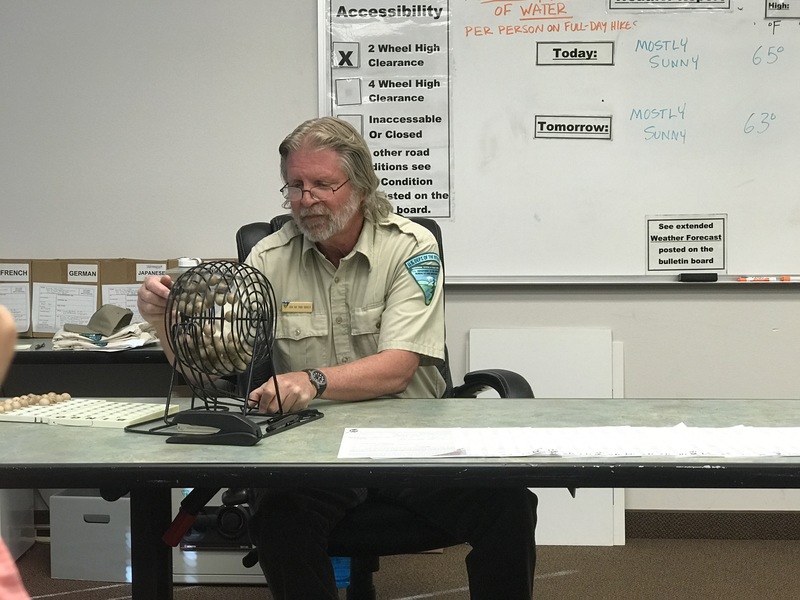 We were funneled into the small lottery room where each party filled out their application, watched the ranger drop the small bingo balls into the turn machine and anxiously waited. At 9 on the dot the application process was closed and we were each given our numbers- I was number 19 and there were 54 applications total (some with multiple hikers on it). A roughly 1.8% chance of being chosen. He began turning the machine and slowly spit out balls- almost everyone a group of 1! That’s pretty rare- usually a group of 6 and a group of 4 get chosen early and that’s it. One by one the permits disappeared and with one left he announced that he would authorize an eleventh permit for the day so that he wasn’t encouraging anyone to hike alone. He spun again- and a group of 3 was chosen, but rather than figure out who to leave behind, they declined the permit. There was still hope! Unfortunately the next ball didn’t land in my favor but that’s ok. It was worth it. The suspense! The drama! I’ll definitely be back at 9am tomorrow for round two. After our unlucky stop at the BLM center we moved on to the PO and grocery store and then Helen dropped me back off at the hotel and took off down the road to continue her adventures. I am so thankful for her visit. The refreshing jolt of positive energy I needed. I returned to the coffee/gear shop where I charged my phone and chatted with a lovely fellow traveler- Tatiana- who was doing the same. From Alaska, she’s also living the dirtbag climber vanlife as she road trips from Alaska to the Panhaddle of Florida, and then back up through Kentucky and Minnesota before returning to Alaska in mid-June for lasik and then back to work in Antarctica in October. What an awesome story! 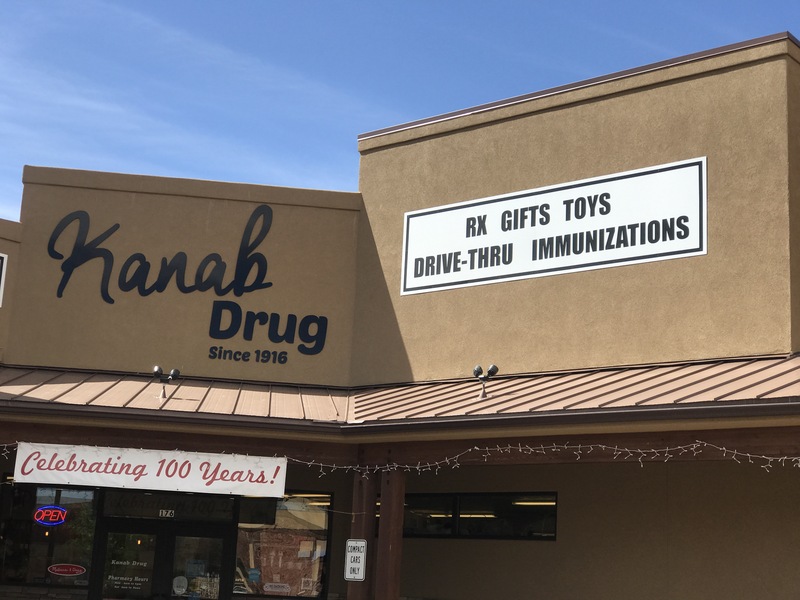 I walked around and explored Kanab for a bit too. The future is here! Drive Thru Immunizations! It’s a nice (though spreadout) town. It’s where John Wesley Powell set up his base of operations in the 1870s as he explored and mapped the area, and it’s also well known for being a western movie and tv hub in the 40s-60s. Utah’s Little Hollywood. The streets are lined with their “Walk of Fame” for all the movie stars who filmed here over the years. This has been my most relaxing and restful day off. Thankful for the downtime and more peaceful mind and looking forward to the days ahead. Also! For those of you in Seattle: tomorrow (Thursday April 27) is Dining Out for Life one of Lifelong’s biggest fundraisers. All you have to do is go to eat at one of the participating restaurants in the link above and eat a meal! They’ll donate 30% of your bill to support Lifelong and Chicken Soup Brigade’s awesome work! Don’t live in Seattle? (Or even if you do!) 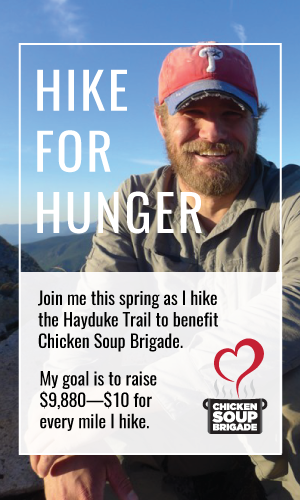 You can help too by supporting my Hike For Hunger. I’m almost 50% of the way to my fundraising goal of $10/mile (but over 50% done with the hike). A $100 donation gets you a postcard from the trail, and I’m carrying a bunch with me that I’d love to send out! No matter how much you contribute your generosity is so appreciated. And thanks again for everyone who is reading and following along! It’s such a joy to hear from everyone. Happy Trails! do a story on your journey. Jim, that’s amazing. Thank you so much for your generosity and all you’ve done to support this journey!